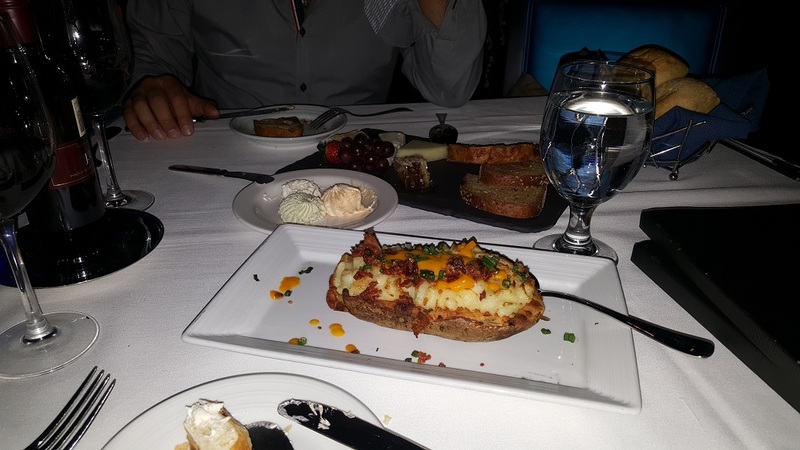 Our first meal in Las Vegas was at the fancy Top of the World restaurant up on the 106th floor of the Stratosphere Hotel. I had heard about this restaurants years ago, especially about its exquisite desserts, and it was on my bucket list to try it. After all, it is voted every year as one of the top restaurants in Las Vegas and one of the most romantic ones (suitable for romantic dinners and special proposals). So the first thing I planned when booking our quick getaway was to make an online reservation a few days before. 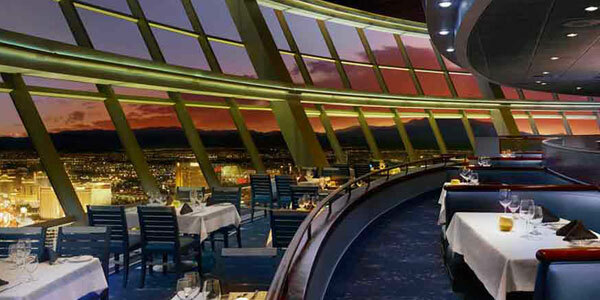 Upon arrival to the Stratosphere, we were guided to the elevators to reach the restaurant where waiters greeted us and escorted us to our table. The place is spacious, dimly lit and buzzing with life, chatter and laughter. The first impression was amazing! 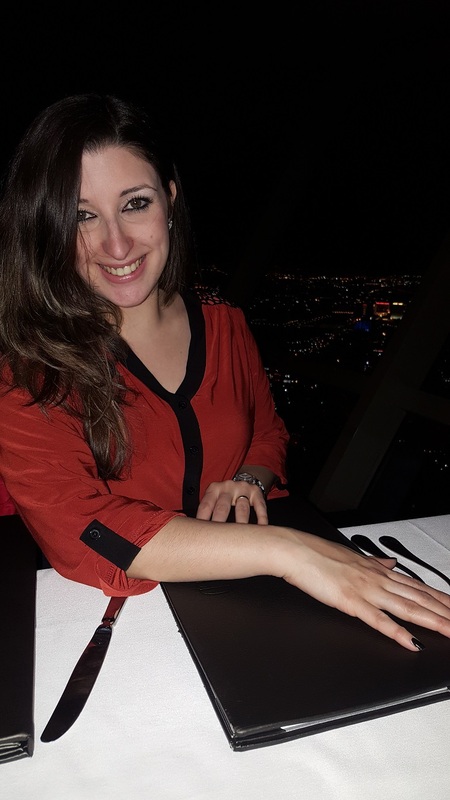 We were seated and handed the menu, and then a waiter came and explained to us that the restaurant makes a full, 360 degree rotation while we will be enjoying our meal to the sensational view of the entire Las Vegas valley. The full rotation takes exactly 1 hour and 20 minutes to be complete. Fascinating! At the center of the restaurant is the bar area followed by tables around it and then a second line of tables adjacent to the glass facades overlooking all of Vegas and its mesmerizing bright lights. The view is out of this world, and that is but an understatement. We felt like some cheese and wine because the ambiance was suitable for that, so we had the cheese course which is good for two people. We also ordered the wine bottle recommended by the super professional waiter. For some reason, I was craving baked potato and they happen to have it as a side on their menu, so I ordered it. A selection of breads and butters were served at first. The 3 butters (orange, garlic and plain) were unbelievably good. The cheese course consisted of 3 cheeses – St. Andre, Maytag Blue & Manchego – served with some honey comb, seedless grapes, a strawberry and multigrain & walnut raisin toast. A classic taken up a notch to say the least! All 3 cheeses were delightful, and the toast was crunchy and slightly chewy (perfect texture). I can’t stand blue cheese normally but there was something about the overall atmosphere that made me taste it. It wasn’t that bad, but I wouldn’t have it again (not a blue cheese fan at all). 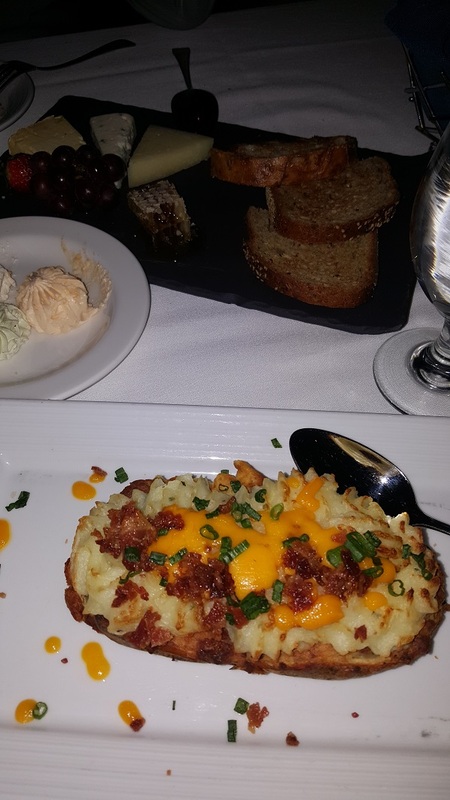 The twice baked potato was the best that I had ever had! It comes with crispy and salty bacon bits, melted cheddar cheese and sprinkled with green onions. Super yum! While we were having dinner, a guy suddenly jumped from the rooftop. We were in complete shock! You don’t get to see that every day. Then I noticed a sign on the wall that warned diners of such bungee jumps lol! Then came time for dessert. Frankly, I wanted to visit this restaurant just for the view and the dessert, and that’s why we did not order any mains. We wanted to leave room for the special sweet treat. This is mainly why my hubby and I were so disappointed! 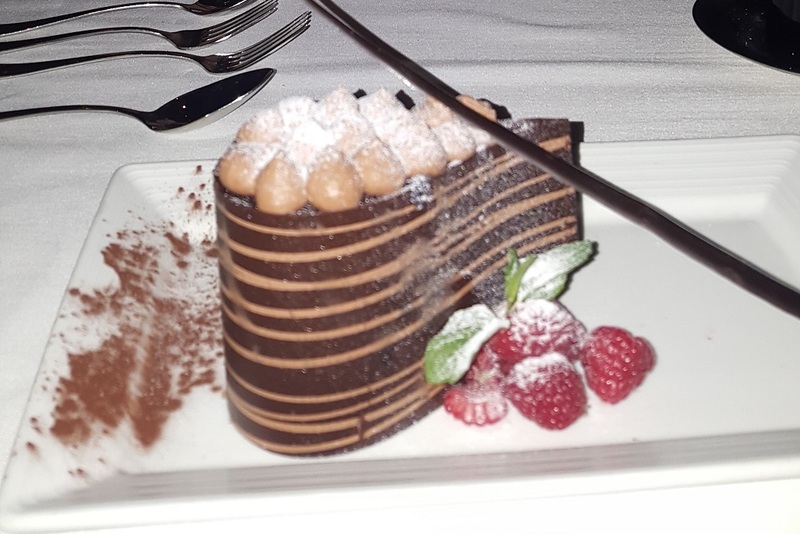 He ordered the Chocolate Lover’s Dream: a moist chocolate cake, Grand Marnier and semisweet chocolate mousse, all wrapped with a teardrop shaped dark chocolate shell. We both agreed to give the presentation a 10 and the taste a 6. The dark chocolate shell was tasteless and the cake would have done without it! 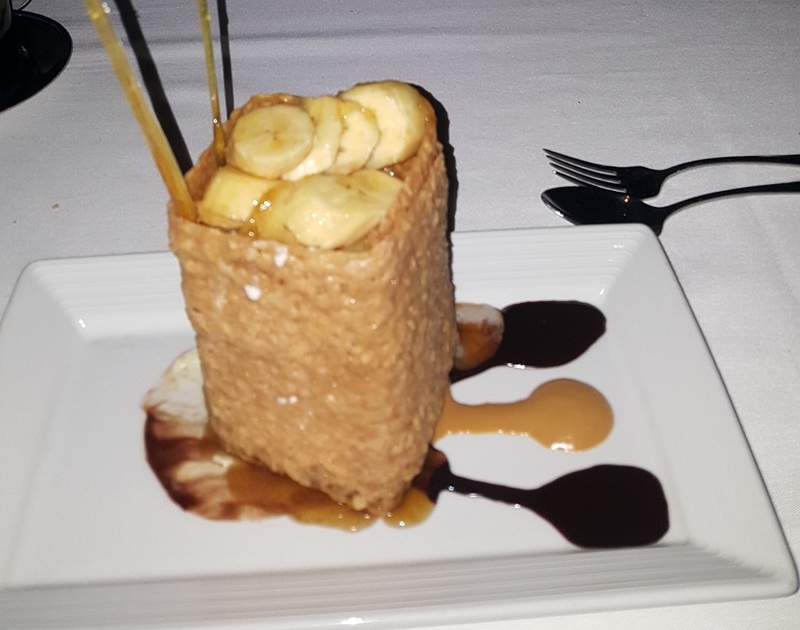 I had the Bananas Foster in a Florentine box (a crunchy edible box made of caramel and almonds). The waitress came and poured the fresh slices of banana soaked in Foster sauce and Myers’s Rum atop the vanilla ice cream inside the Florentine box. I loved that! However, again, the presentation is really nice, but the vanilla ice cream was not up to my expectations. It tasted too commercial and I didn’t see any vanilla specks in it! Plus, the portion is huge! Such restaurants shouldn’t serve such huge portions in my opinion. I could barely get through half of my dessert. The overall experience was second-to-none. As my friend Danielle put it, the view sells itself. The food we tried was exceptional. The desserts, average unfortunately. I would most definitely come back and try other menu items as well as different cocktails next time I visit Vegas.